Hampshire, IL – July 29, 2015 – Canterbury Farm just completed three weeks competing at the Great Lakes Equestrian Festival at Flintfields Horse Park in Traverse City, MI. The team had great results across the board, with riders from short stirrup up to the grand prix level bringing home top ribbons. 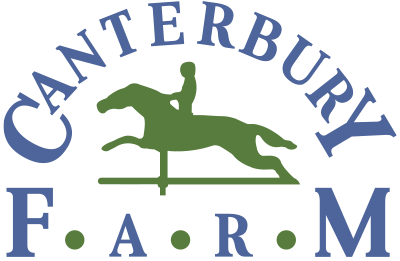 Owned by the Franklin Family, and operated by head trainer Greg Franklin and trainer and rider Caitlyn Shiels, Canterbury Farm is a hunter/jumper training facility based in Hampshire, IL. Canterbury Farm began competing during the second week of the four-week festival and kicked things off with fantastic results, including three reserve championships. Caitlyn Shiels was reserve champion in the 1.35m jumper division with her young horse, Cavalier II. Vocarday, who is for sale and currently owned by Sherree Holliday, was reserve champion in the Great Lakes Open Hunter 2’9” ridden by Shiels, and Maddie Pogorzelski was reserve champion in the Low Children’s Equitation aboard Marcia Franklin’s Cydelle. Greg Franklin’s neice, Molly Zygmont, also jumped to a win in the Children’s Pony Hunter Classic riding her pony, Pumpkin Pie, in their first week in Traverse City. Serafina, owned by Michelle Durpetti, made her debut in the USHJA National Hunter Derby to conclude the week with Shiels in the irons and finished 12th. During week three of the festival, Molly Zygmont and Pumpkin Pie won the Children’s Pony Hunter Classic for the second week in a row. Natalie Alden’s King of Hearts was reserve champion in the Pre-Green 3’3” division and placed second in the USHJA Pre-Green Incentive Challenge as he prepares for the Pre-Green Incentive Championships coming up in August. Timeless and Lesley Quillen won the Handy in the 3’3″ Amateur-Owner Hunters, and Balida, owned by Katherine Heywood, placed third in the USHJA National Hunter Derby. Shiels and Cavalier II also competed in the $25,000 Welcome Stake and the $50,000 Grand Prix after just stepping up to the grand prix level a few weeks ago. The success continued into the final week of competition in Traverse City. Katherine Heywood and Balida won their first class in the Amateur-Owner Hunter 3’3” 18-35 division with a victory in the handy round. Michelle Durpetti also jumped to great results with her horse, Frisco, finishing second and third in the Adult Amateur Hunter 18-35. All of the horses and riders of Canterbury Farm had a great time competing in Traverse City and look forward to competing this week at the Lamplight Equestrian Center in Wayne, IL, for Equifest.